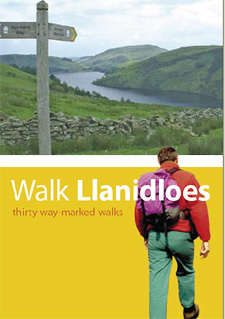 Welcome to Walk Llanidloes. Here you will find 17 downloadable and printer friendly route descriptions and maps for you to make the most out of walking in Mid Wales. Sarn Sabrina Based on the Celtic myth of Sabrina, a water nymph said to inhabit the waters of the Severn, we have created a 25 mile circular route taking in Llanidloes, the Llyn Clywedog and the source of the river high up on the slopes of Plynlimon. The Sarn Sabrina Walk is both a one day challenge walking event held on the last Saturday in May and a trail that can be walked over a number of days for you to savour the beautiful views the route encompasses. The Semi-Sabrina is approx 12 miles in length, and is a shorter version of the walk taking in Glyndwr’s Way and the Llyn Clywedog Nature Trail. There are a number of viewing points arranged along the circular drive around the lake that allow the visitor to make the most of the wonderful panoramic views. The National Trail of Glyndwr's Way also passes beneath the dam before pursuing a course along the southern shore of the lake, making this one of its most picturesque stages. The Cascades Trail, a half mile walk designed with the cooperation of the local Disabled Association. The Blaen Hafren Falls Trail, a three mile walk through the heart of the forest. The Severn-Breaks-its-Neck Trail, one and a half miles long and featuring the first real waterfall on the Severn. The start or finish, depending on your point of view, of the Wye Valley Walk. The Source of the Severn Walk, a seven mile round trip with panoramic views. 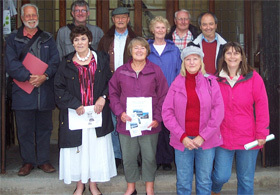 Llanidloes town guides conduct free escorted walks around this historic market town. A group of 10 volunteers have been doing their homework and learning interesting facts about the buildings and people since its beginnings centuries ago. The Walking Network. Over thirty separate circular and linear routes have benefited from new way-marking, fingerposts, gates and stiles* linking Llanidloes with the surrounding villages of Llangurig, Llandinam and Trefeglwys. *Funded through the Powys County Council administered Community Tourism Capital Grant Scheme. Village Walks. Five walks which link Llanidloes with some of the surrounding villages.